As the one hundredth anniversary of Mieczysław Weinberg’s birth comes ever closer, there is a marked number of new recordings. 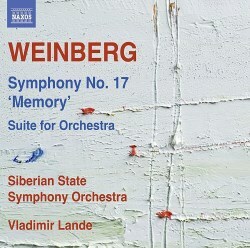 For me, the litmus test for Weinberg’s establishment in the repertoire will be the top orchestras taking up his work. Both Naxos and CPO have been doing sterling service promoting Weinberg’s music. Naxos has been issuing mainly symphonies and some chamber music. CPO has released predominantly chamber and solo piano music, although there has been an album with the Violin Concertino and Symphony No. 10. The Naxos release consists of the Suite for Orchestra and the Symphony No. 17 “Memory”, pieces written over thirty years apart. From 1950, during a particularly challenging period for Soviet composers, the Suite for Orchestra is an absorbing five-movement score. There seems to be no record of a performance prior to this recording. Throughout, the light and attractive writing with its tongue-in-cheek humour reminds me of the Shostakovich Jazz Suites from the 1930s. Especially memorable is the high-flying violin part in the lovely Romance and the Galop, a madcap romp. The Suite seems perfect for the playlist of commercial radio station Classic FM. how Weinberg creates a sense of powerful tension: nerve-shattering writing with a sense of dark foreboding. The prevailing mood differs in the short third movement conveying a feeling of squally, nervous activity. The Siberian State Symphony Orchestra is a splendid ensemble. Under conductor Vladimir Lande the assurance and undoubted preparation pay dividends. Clearly the orchestra has the measure of these two works, persuasively communicating contrasting sides of Weinberg’s musical personality. Recorded at Krasnoyarsk Philharmonic Great Hall, the engineering team has provided first class sonics, clear, with presence and good balance. The booklet contains a helpful essay written by Richard Whitehouse. 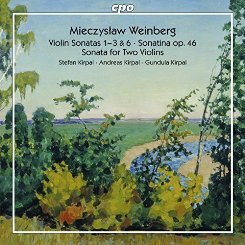 CPO first volume of Weinberg works for violin and piano, issued back in 2009, comprised of the Violin Sonatas 4, 5 and Three Pieces for violin and pianos (see Jonathan Woolf’s review). Seven years later, a two-CD second volume brings the first, second, third and sixth Violin Sonatas, the Violin Sonatina, Sonata for two violins and Moldavian Rhapsody. All the works are played by brothers Stefan and Andreas Kirpal, with the exception of the Sonata for two violins where Stefan is accompanied by Gundula Kirpal. The Violin Sonata No. 1 was composed in 1943 during Weinberg’s time evacuated in Tashkent, capital city of Uzbekistan. Dedicated to his father-in-law celebrated Soviet/Jewish actor Solomon Mikhoels this is a generally dour score contrasted with episodes of good natured lyricism. The central movement Adagietto feels like Weinberg could be depicting a gruelling struggle. Written in 1944 the Violin Sonata No. 2 was not premièred until 1962 by David Oistrakh who is the dedicatee. A determined character of unyielding seriousness pervades the score. The Violin Sonata No. 3 bears a dedication to violin soloist Mikhail Fichtenholz. I find the score lyrical with a slightly bitter aftertaste. There is a rather secretive feel to the central movement Andantino noticeably insular in character full of introspection. In 1948 Weinberg was censured by the Soviet authorities for formalism and the Violin Sonatina was written the next year. Surprisingly the score was not packed with the overt folk-like material which composers were encouraged to employ. The writing is principally earnest often solemn. A striking central movement, slow and mysterious, contains a short contrasting rumbustious section. Dated 1959, the Sonata for 2 Violins is evidently receiving its first recording here. The score was dedicated to Leonid Kogan and Yelizaveta Gilels, the sister of eminent pianist Emil. Overall, tension and determination are the prominent characteristics of the writing. Typically for Weinberg sonatas, the central movement provides contrast which evokes here an uneasy calm over a bleak landscape. Weinberg’s final work in the genre, the Violin Sonata No. 6 written in 1982, is one of several scores dedicated to his mother Sarra (Sura) who it seems died in Trawniki concentration camp. The work is cast in a single movement with four distinct sections. Not surprisingly, this is a generally bleak and austere work. It opens with an extended passage for solo violin. Marked Moderato, the first and third sections contain unsettling music, nervy and tense in nature. The two Adagio sections convey a dragging feeling, lacking in energy as if exhausted, all spent. Next we hear the memorable Rhapsody on Moldavian Themes which Weinberg completed in versions for orchestra and for violin and piano. Perhaps owing to his mother’s heritage, the music is heavily accented with Moldavian folk melodies in a stirring, highly lyrical style obviously in keeping with the Soviet authorities’ demand for relatively simple, melodic and traditional folk music. Throughout the album one feels the wholehearted involvement by the Kirpal siblings Stefan and Andreas (and Gundula Kirpal in Op. 69). Marked by such highly expressive playing, remarkable are their extraordinarily high levels of vivacity and technical virtuosity. Recorded at two locations, Unterhaching and Burghausen, the sound is to a consistently high standard, clear and satisfyingly balanced. Weinberg biographer David Fanning has penned the booklet essay, interesting and detailed. Weinberg’s reputation is remarkably well served by these two releases. They display different sides of the much talented Soviet composer. Particularly impressive are the Suite and Seventeenth Symphony, distinctive works that deserve a place in the concert hall.